Rejoice! Rejoice! Poems for the Holidays is a book of Christian poetry. Throughout scripture the people of God are called to rejoice because He is King and Creator of all and because He loves us. One of my favorite verses is Philippians 4:4, which says, “Rejoice in the Lord always. I will say it again: Rejoice!” This little book of poetry is all about rejoicing in the Lord through the many holidays of the church year. It begins with Advent and preparation for the coming of Christ, at Christmas and in the future. It ends with Thanksgiving and a reminder that God is the source of all we have to be thankful for. In between, you’ll find the Lenten season, Holy Week, Pentecost, and more. Some holidays are somber and others are festive, but all are a reason to Rejoice that God is King and Creator of all. The 72 poems in this book range from free verse to form poetry, such as triolets, pantoums, sedokas, and acrostics. Each is written to help you focus on the One in whom we rejoice. Available on Amazon.com. If you live in Oregon or Washington, contact me to arrange for a book signing event where copies will be available at a discount. 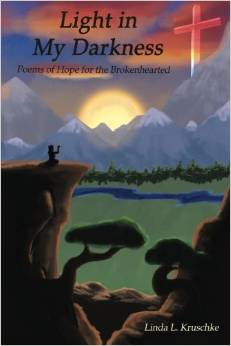 Light in My Darkness: Poems of Hope for the Brokenhearted is my first book of poetry chronicling my struggles with major clinical depression and how God was a light in my darkness of depression. This poetry offers hope for others struggling not only with depression but other trials and tribulations that life throws at every one of us at one time or another. Carol J. Wright, Lake Oswego, Oregon. Hello, My name is David Ramos. I am a fellow Christian author like yourself. I noticed you review books sometimes on your blog (The Robe) and wanted to see if you would be interested in doing a swap. I would send you my book (Climbing with Abraham) so you could review it and in exchange I would review your most recent book (Light in my Darkness) on both my blog and on Amazon. Let me know if you are interested! Have a blessed day! Great! Feel free to send it to davevslife at gmail.com then I can send my book to you as well!